- Hello everybody, how are you? This is actually the second time I've attempted to go live. 'cause we are talking about taking self care today. and I'm ready to chat. that everything is going live. was smart steps to create room. Room for rest and growth. So you get some self care. to eat chocolate live on webcam. how beautiful your classroom looks. to get the impact that you want, isn't it? So let's just do a quick test. 'Cause we've been going for 11 weeks. I wonder if I can do the same thing here. I don't know, I'll give it a go. mm, ooh, I need a bit of a half asleep one I think. What are you guys gonna pick? I don't know what this one is. He looks a little bit fizzled. and we've had to support them through it too, haven't we? and it doesn't have to be a full paper. this is a scrap of paper, so I'm doing well there. I've got this list in the back of my head. And I just feel like I have to do some things off it. that we make time for ourselves. let's give this 24-hour exercise a go. So here is 24 hours in my day. Halfway, mathematics here, we've got 12. A quarter, about six, right? We understand how that breaks up. So 24 hours in my day. How many hours in your 24-hour period do you spend asleep? and so that's about here and I'm just gonna rip it off. So this bit is sleep. resting and sleeping and that's okay. I probably am meant to get eight hours. So I'm gonna put this down over here by my mic. so these are my waking hours. and I'm gonna assume that this day is a work day. I'll probably do another hour of work. So let's say 10 hours. Oh gosh, okay, so where was the halfway point again? my working time off, you ready? Here's what I'm left with. Right, okay, so now I've got things like, chores. too much time to that. but I'm not sure how I'm going to. I'm gonna try to take an hour or so off. After school I have to hang out with my little person. I want to hang out with my little person. to do that everyday in the morning. Oh my goodness, look how small. Ooh, I'm gonna get off the edge. This little slip of paper is for me. and I had to do that in my own time. (laughing) this is really hard. An hour everyday reading papers. I do, I do tend to read a lot. Can you see what happens to our day? This is, this is what I have left. sleep, chores or family, or study. that you don't even have this in your hand. and you are left with absolutely nothing. Look, let's go through it. is that it starts again tomorrow. let's think about them as a circle and it never ends. no one's gonna sleep in them for months. much more of a priority? you cannot possibly be feeling guilty. to other things and other people. what you're gonna do with that time. that you stick on your fridge in front of everyone's faces. and you're just going to pick something from that list. So, how many of you have had a go? It's Christina, it is so important, isn't it? it you are feeling guilty, I've dropped it, it's so small. come on now, be fair to yourself. these are the things you're doing. lunch today and you don't. can you manage it a couple of times a week? we could do with the kids, isn't it? About filling your bucket too. without hibernating for a few weeks clearly, hey. So, many of you have had a go at this exercise? Let me know and what did it look like? Did you have any paper left at the end? with the hashtag reflectionists to show me. of all of your self care lists. and on that page you're going to find the podcast. struggles to switch off, you might want some assistance. and I'm just scrolling down here. I've got my computer in front of me. 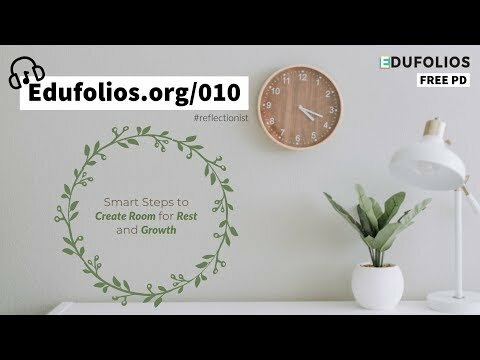 about avoiding teacher burnout which is what we're doing. and then some tools you can use to chill out. Have you heard of calm.com? Who uses that in their classroom? I use it all the time in my classroom. and I also have Buddhify. I heard about that at a teach meet once. Have you had that one? and they have a fantastic app. I hope you've found it. I've got it on my phone here. and it actually has whole programmes for grownups. the Smiling Minds app is perfect for that. your brainwaves calm down and chill you out. that actually every time makes me fall asleep, every time. and you can even ask for it on Spotify. so I've done six of them. I'm trying to remember what the next one is about. your evidence post and breaking that ice. tune in next week to the Reflective Teacher podcast. and particularly this self care one. Basically I wanted an excuse to eat more Cadbury's. if you tell your teacher. that seems to get around that. Well, if there are no questions, I will see you later. and I will reply to them. breaking the ice on your ePortfolios for accreditation.